In issue 4/2015, AutoBild sportscars (D) has published the Summer Tyre Test 2015. 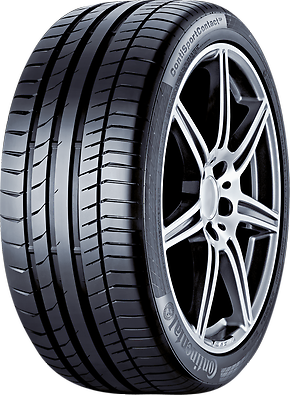 The tyre size was 255/35 R 19 (front axle) and 275/35 R 19 (rear axle). Test car was a BMW M4. The German magazine sport auto has published (04/2015) an UHP Summer Tyre Test. The tested tyre size was 235/35 R19 Y and the test vehicle a VW Golf R.
Rating for the ContiSportContactTM 5 P: "recommended"
The German magazine Auto Bild sportscars (issue 4/2012) has published the UHP summer tyre test 2012 for the dimension 245/30 ZR 20. Test vehicle was a VW Scirocco R.
Over-all verdict: "Top Class Sport Tire." With precise steering and maximum grip under all conditions, the ContiSportContact™ 5 P puts you in total control of your vehicle. Whichever road you're on, the tyre adapts perfectly to its surface – especially during fast cornering. Continental’s innovative Black Chilli Technology ensures that the ContiSportContact™ 5 P doesn't only go fast - it stops fast too. 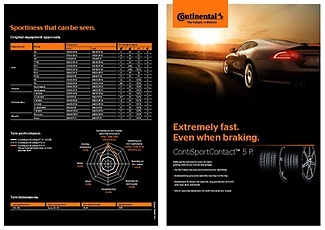 The ContiSportContact™ 5 P is the current AutoBild test winner for 2014 summer tyres.